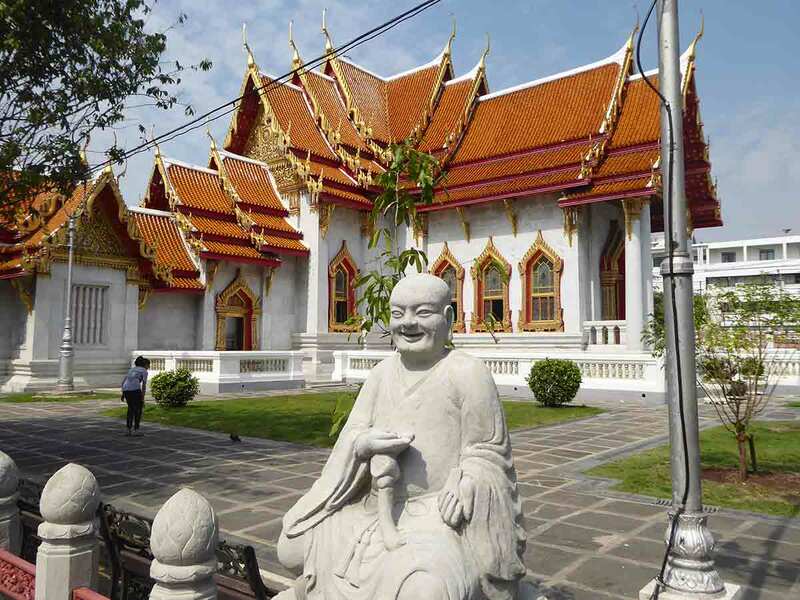 Wat Benchamabophit is one of the most beautiful temples in Bangkok, located within the Royal Dusit district, a short walk from Chitralada Palace and the Royal Plaza. 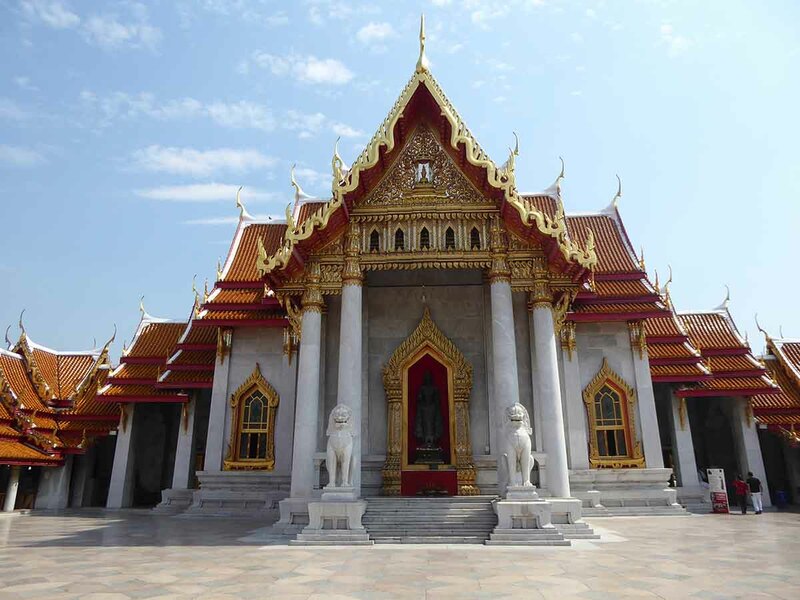 It is also known as the marble temple due to the extensive use of marble in the construction. Built-in 1899 during the reign of King Rama V the temple features European inspired ecclesiastical features such as stained glass windows. The ordination hall interior made from Italian white Carrara marble. 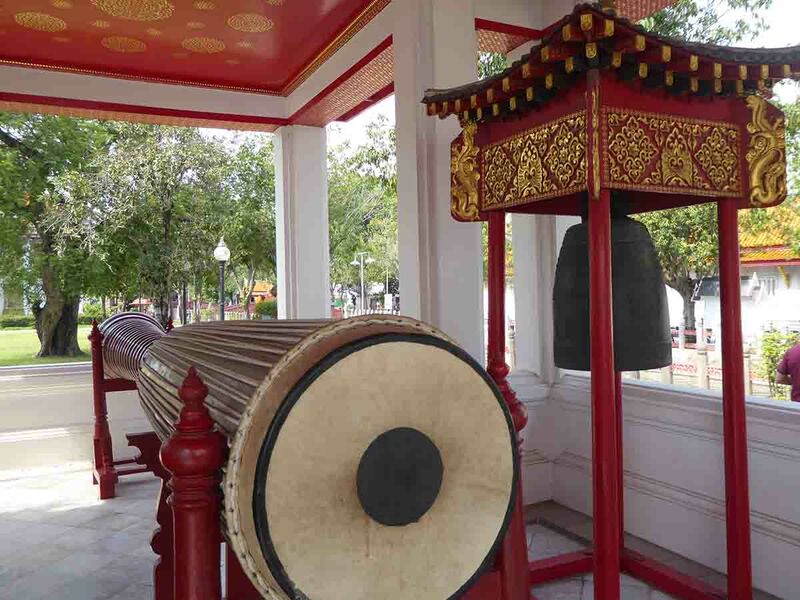 The bronze Buddha image contains the ashes and relics of King Rama V which are in the base. 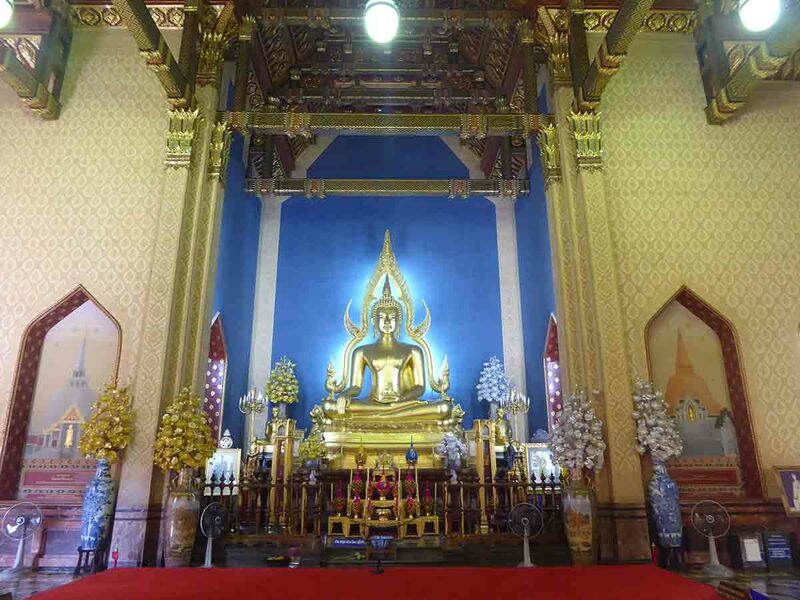 The hall is colourful with gold and white walls rising from slabs of crimson, grey and ochre marble, patterned marble floors and a sky-blue wall behind the Buddha image. 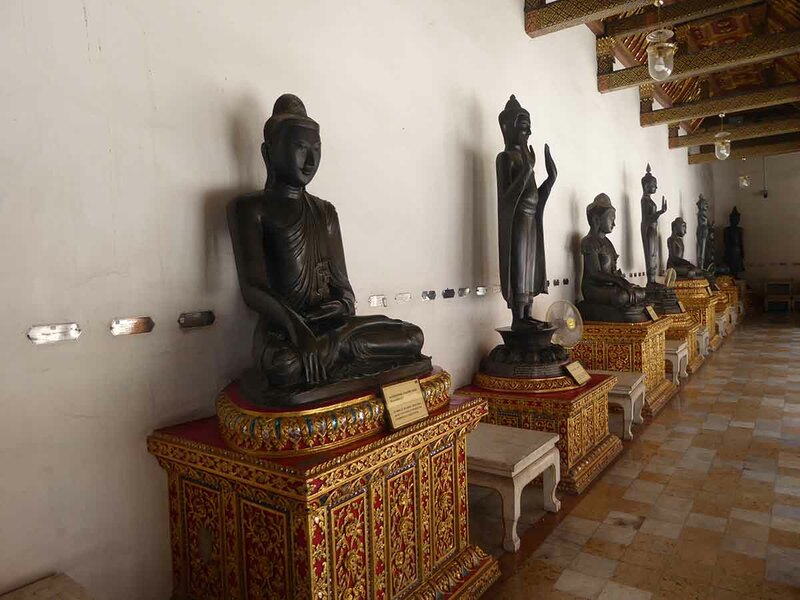 Paintings of important stupas from all over Thailand adorn the walls. The exterior features large marble pillars and marble lion guardians in both the front and rear. The cloister at the rear houses a collection of 52 Buddha images of various styles and periods around a marble courtyard. 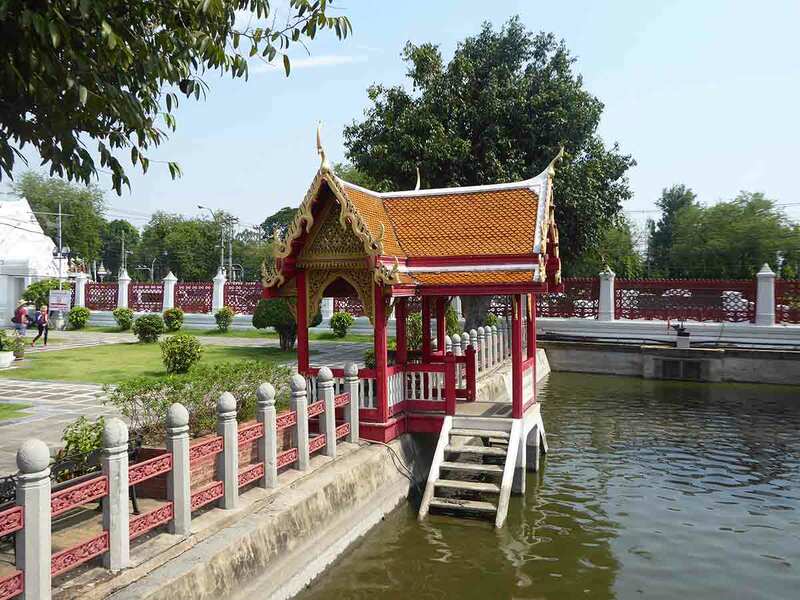 The temple setting is attractive and picturesque within leafy grounds that feature a small canal which you can cross using a footbridge which leads to the monks living quarters which are in well maintained European style wooden houses. There is also a marble belfry complete with temple drums. In the early morning between 06.00-07.30 monks line up outside the temple to receive alms which typically include donations of food, toiletries, and other essentials. Location: Corner of Sri Ayutthaya Road and Nakhon Pathom Road, Dusit district. Rules: No shorts, short skirts, sleeveless shirts. No shoes inside the hall. Bus: No. 5, 16, 23, 50, 70, 72, 99, 201, 503, 505, 509. BTS to Phaya Thai station, then taxi (50 baht).